Plusnet - Speed lower than Openreach DSL Checker Estimate. Re: Plusnet - Speed lower than Openreach DSL Checker Estimate. A notable difference between the stats from the HG612 and the Zyxel was the the HG612 had R=14 on the downstream, whereas the Zyxel had R=0. So the HG612 put some FEC bytes on the downstream, with zero INP and no interleaving. 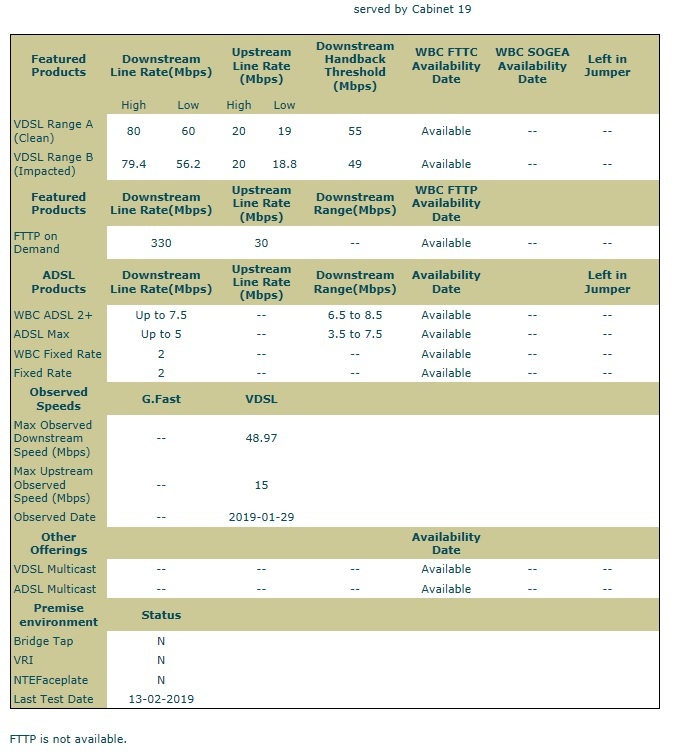 Both modems have some FEC on the upstream (which may be the DSLAM's decision). I think we've seen before that some modems (Lantiq) tended to apply some FEC when on zero INP, while others didn't. And the HG612 gave slightly more bandwidth despite the FEC data taking up some bandwidth . What modem works best on one line may not be the same as what works best on other lines, obviously just use whatever works best on yours. MJ Quinns are to install a new DSLAM cabinet and 25m of ducting to be laid in footway and grass verge. Planned 11th to 22nd Feb. Location right where my existing cab is. Now oddly I did notice one of their vans and engineers working last night at the location as I drove home around 6.30, coincidence I wonder? I was on an ECI cabinet and they installed a Huawei. I jumped through a couple hoops and got on the Huawei cabinet. Both cabinets synced roughly the same on the downstream but DLM changes give me 14Mb extra on the Huawei cabinet. The Huawei cabinet synced way higher than the ECI on the upstream. 15 days now since the Zyxel was installed and holding steady. Looking at the connection speed graphs (with max attainable ticked) the max attainable never goes higher than the current speed. Is that a firmware bug? A further musing on my part, the install is old (1950's estate) and the overhead cable (up to the eaves) has been replaced in the last decade, but the line-in cable wasn't. It was joined under the eaves, where I am sure no joint prior to the overhead being replaced. Could that be hindering performance?
. . . the install is old (1950's estate) and the overhead cable (up to the eaves) has been replaced in the last decade, but the line-in cable wasn't. It was joined under the eaves, where I am sure no joint prior to the overhead being replaced. Could that be hindering performance? That will be very unlikely. Well the new cabinet is now on-site and it sure looks like a Huawei one. Not sure if it means anything, but it looks like there is new tarmac running from it to the old ECI cabinet as well as to the PCP a short distance away. They only install Huawei cabinets now. Single door and larger double door versions with different capacity in each. The tarmac to the PCP is for the tie cables. The path to the ECI will be for the power supply and fibre. Thanks for explaining that j0hn. It is a single door unit that has been installed. PN have said they have no options to request a cabinet change. I had to terminate my FTTC and order it again to get switched cabinets. A temporary downgrade to ADSL then upgrade to FTTC should see a cabinet change. Ordering a 2nd line then cancelling the 1st would also work. That's providing the above is done after the new cabinet is live. I don't expect OpenReach to entertain requests for a cabinet switch. edit: I've just posted on the Plusnet forums. If you are below estimates then Plusnet should be able to request a port swap. No guarantee it would swap you to the Huawei but they should be able to try. Is the ECI full? An address check on the BT Broadband availability checker will show a waiting list of it is. Thanks j0hn. Result of address availability checker attached. In my last PN thread all I was offered was to leave without penalty if I was in contract, which I am not and am pretty sure they would know that to be the case. I guess switching to ADSL and then back is a 50/50 gamble. Looks like the estimates have been increased since I started this thread. Is that by number or address? Number checks show available even if the cabinet is full. Address checks correctly show the waiting list. edit: ignore that. I can tell it's a number check by the extras fields on the checker. The cabinet not being full will make it difficult to tell when the Huawei is live. 11.30 or so yesterday morning yesterday it looks like my max attainable rate took an upward turn and PN now see it in sync at 53Mbps, where it was 48Mbps before. Edit: Can post stats around the time it happened, just let me know which ones you would like. Well that was short-lived, approx. 11.30 today and sync back down again to where it was. One of the things I have noticed is that the attainable rate graph goes up and down a fair bit, when the sync was higher over the last couple of days it was much smoother. Not sure if that means anything at all.